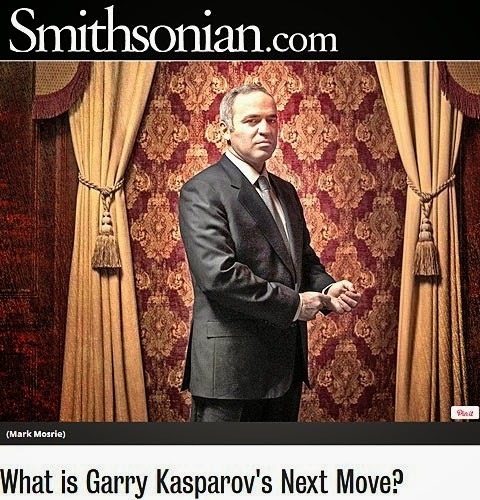 Garry Kasparov in "Smithsonian Magazine"
Garry Kasparov is interviewed by Ron Rosenbaum in Smithsonian Magazine. 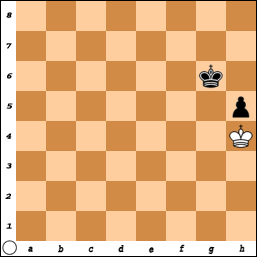 On Sunday, I finished with a score of 1-1-2 and a zero point bye in the tournament at the Marshall Chess Club. 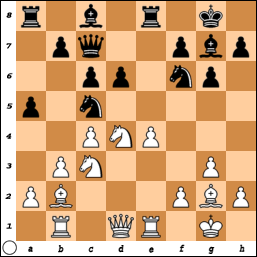 34.Kc5 Nf5 35.Kxc6 Nxh4 36.Be1 Nf3 37.Bg3 Nd4+ 38.Kc5 Nc2 39.Kxb5 Nxa3+ 40.Kc5 Nc2 41.Kc4 Ne3+ 42.Kd3 Nf5 43.Bh2 Kd5 44.Ke2 Ne7 45.Kf3 Ng6 46.Bg3 Nxe5+ 47.Bxe5 Kxe5 48.Kg3 Kf5 49.Kh4 Kg6, draw. 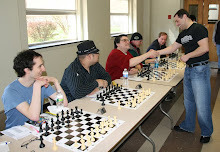 On Saturday, these games were played in the tournament at the Marshall Chess Club. 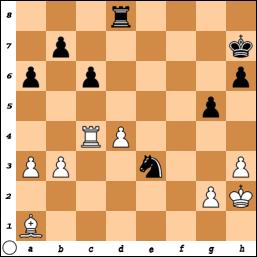 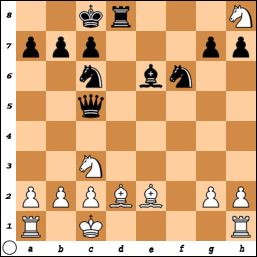 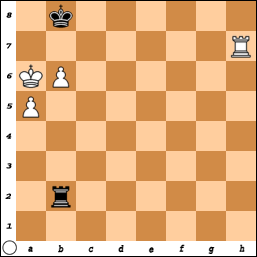 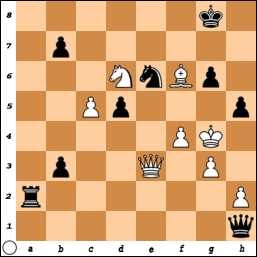 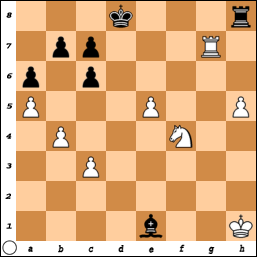 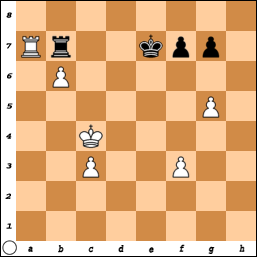 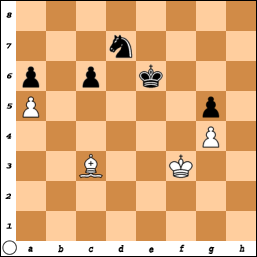 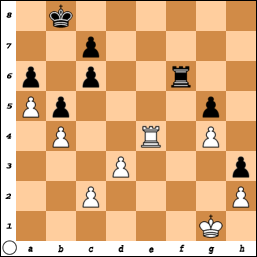 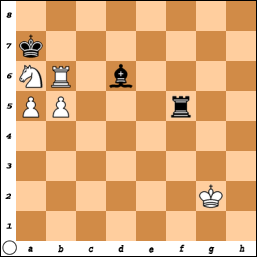 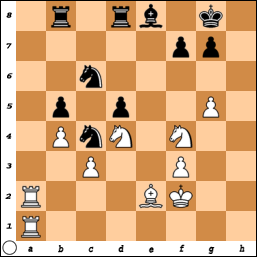 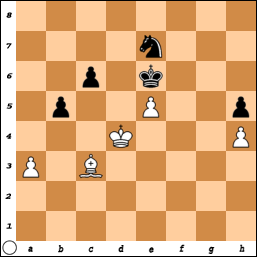 51.Ke4 Nc5+ 52.Kd4 Nb7 53.Bd2 Kf6 54.Kc4 Nd6+ 55.Kd4 Nb7 56.Kc4 Nd6+ 57.Kd4, draw. 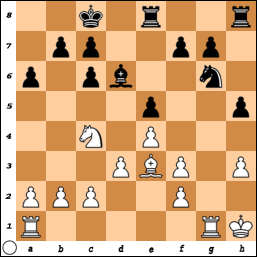 51.Kg1 Bc5+ 52.Nxc5 Rxc5 53.Kf2 Rc2+ 54.Ke3 Ra2 55.Ra6+ Kb7 56.Kd4 Rc2 57.Rh6 Ra2 58.Rh7+ Kb8 59.Kc5 Rg2 60.b6 Rc2+ 61.Kb5 Rb2+ 62.Ka6, Black resigns. 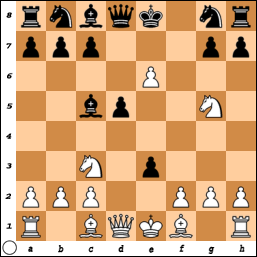 Last Tuesday evening, I played this game at the Marshall Chess Club. 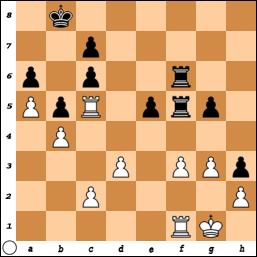 34.g4 Rxf3 35.Rxf3 Rxf3 36.Rxe5 Rf4 37.Re4 Rf6 38.Re5 Rf4 39.Re4 Rf6, draw. 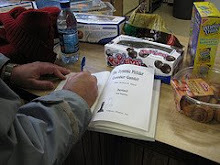 On Presidents Day, these pictures were taken by me at the USATE 2014. 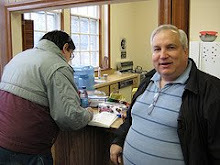 Last Sunday, I took these pictures at the USATE 2014. 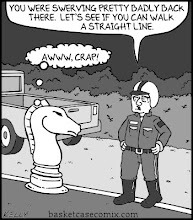 Take a look at the U.S. 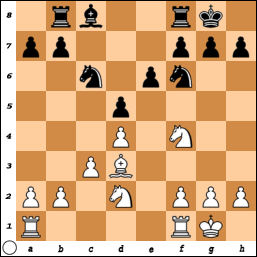 Chess Scoop on the USATE 2014. 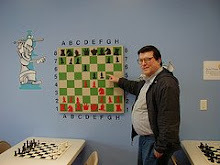 Candidate master Lev Zilbermintz [pictured] sends a blitz game, from the Internet Chess Club, in which he defeats a grandmaster with the PCG. 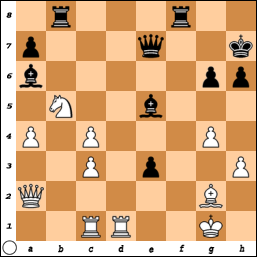 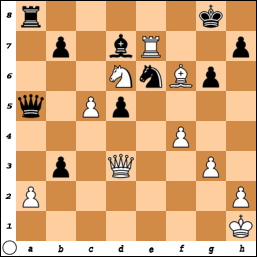 8.Qxd5 Qf6 9.Qxc5 Qxf2+ 10.Kd1 e2+ 11.Bxe2 Qxc5 12.Nf7 Bxe6 13.Nxh8 Nc6 14.Bd2 O-O-O 15.Kc1 Nf6, White resigns. 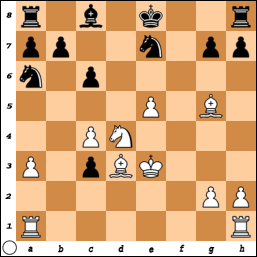 On Monday, I finished with a score of 4-1-1 at the USATE 2014 in Parsippany. 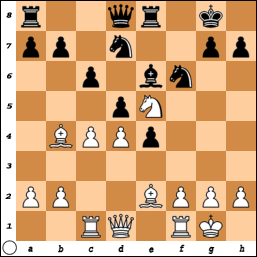 30.Nd4 Rf2 31.Nc6 Qb7 32.Rb1 Rxa2 33.Rxb7+ Bxb7 34.Rd7+ Kh8 35.Nxb8 Rxg2+ 36.Kf1 e2+, White resigns. 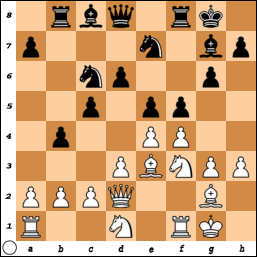 This game took place on Sunday at the USATE 2014. 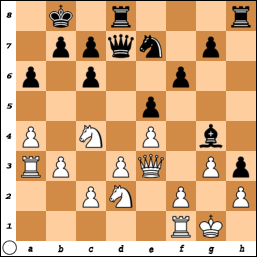 30.Rxd7 Qe1+ 31.Kg2 Rxa2+ 32.Kh3 Qh1 33.Rg7+ Nxg7 34.Kg4 Ne6 35.Qe3 h5+, White resigns. 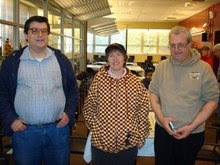 Pictured from the USATE 2014 is the team Ferrero Forever with Irina Krush, Jim West, Steve Hrop, and Michael O'Connor. 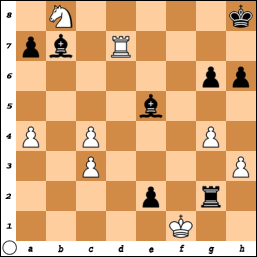 31.Nxc6 Bxc6 32.Rd1 Rd7 33.Bxc4 bxc4 34.Ne2 R7d8 35.Nd4 Bb7 36.Re1 Re8 37.Rxe8+ Rxe8 38.Ra7 Re7 39.Nc6 Rd7 40.Na5 Bc8 41.Ra8 Rc7 42.Ke3 Kf8 43.b5 Ke7 44.b6 d4+ 45.Kxd4 Rd7+ 46.Kxc4 Bb7 47.Nxb7 Rxb7 48.Ra7, Black resigns. 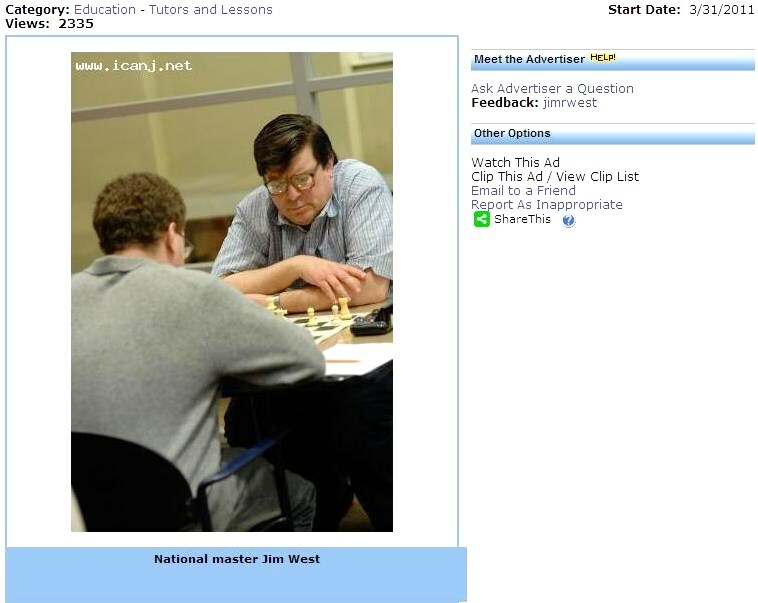 Yesterday Garry Kasparov made an appearance at the U.S. 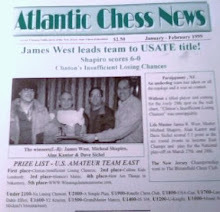 Amateur Team East tournament in Parsippany. 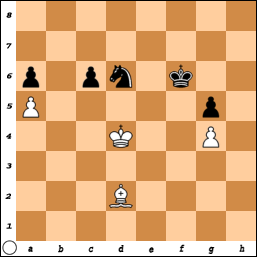 Garry praised world champion Magnus Carlsen for having Karpov's precision and Fischer's determination. 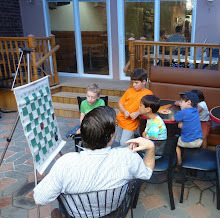 On Saturday, I photographed these players of music and chess in the U.S. 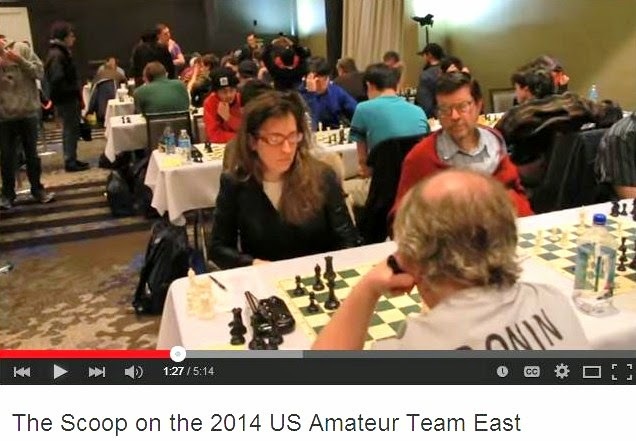 Amateur Team East tournament at the Hilton Parsippany. 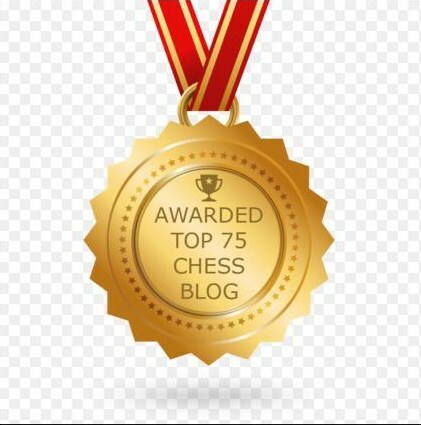 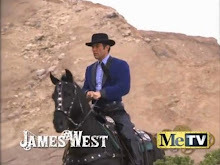 Kindle Edition of "The Tournament"
Ashmun - West @ "Contre Gambit Philidor"
Movie Reviews of "Life of a KIng"